Project EverGreen volunteers helped transform this vacant lot in East Harlem, N.Y., into a sustainable green space and vegetable garden. As part of its ongoing “Healthy Turf. Healthy Kids.” initiative, Project EverGreen completed renovation projects on a park in New York City and a football field New Jersey. In New York City, the organization transformed a vacant lot adjacent the Carter Burden Center for Aging into a sustainable fruit and vegetable garden and community park for the Neighbors of Vega Baja Association in East Harlem, N.Y. 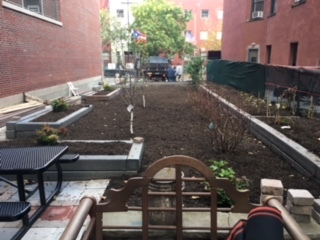 The organization was assisted by New York City Parks Green Thumb agency and local landscape industry professionals—including Artisan Gardens Landscape Construction, Plant Detectives Nursery and Garden Center, and Kevin’s Tree Service. A community service grant from Con Edison and $12,000 in donated time and materials, including 20 tons of topsoil from Kevin’s Tree Service, supported the project. In early 2017, Project EverGreen and Artisan Gardens will return with Con Edison employee volunteers to plant new vegetable bushes. In New Jersey, the organization restored weather-damaged turf fields for the Hazlet, N.J., Youth Athletic League. The field provides more than a thousand football players, cheerleaders, parents and coaches with a greener, safer place to play. Natural Green Lawn Care in Bridgewater, N.J., and Hazlet-based LidoChem made the project possible with donations of time, labor and materials.